This is a longer than usual post about our final day of fieldwork in the Swiss Alps this last September—and it’s the next to the last one in this long series! 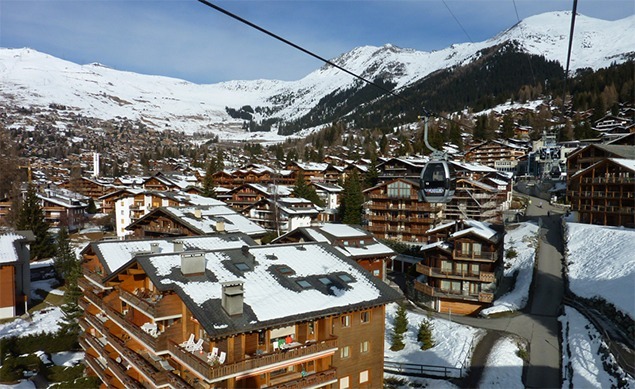 For our final driving excursion, we drove in mid-afternoon via a back road into the fabled ski resort town of Verbier. This was by far the scariest drive of the entire trip; it wasn’t just narrow and steep, but hung over the valley in places with our wheels on the edge—and then the road turned to dirt. The young artist Eric Philipoz, a Valais native and Benoît’s assistant, had done all the driving during our trip, and he managed the track with aplomb. But even he was swearing by the time we reached the outskirts of one of the wealthiest towns in the country. 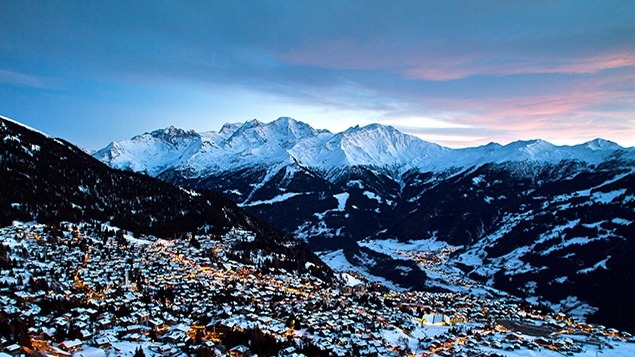 Verbier, which was developed first as a French ski resort in the 1950s, is now one of the wealthiest resorts in Switzerland, a haunt of British and European royalty and Russian oligarchs. The architecture is determinedly traditional Swiss chalet. Fitting contemporary art into this context is a challenge. The art is an urban amenity for some sophisticated travelers and second- or fourth-home owners, but a total disconnect for most permanent residents. 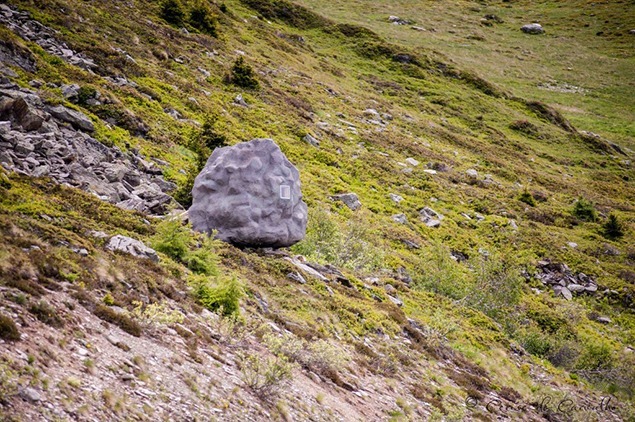 As quickly as we could we located Kiki Thompson and Madeleine Paternot, the co-founders of the Verbier Sculpture Park & Residency, which mounted its first season of works in 2011. Kiki and Madeleine, both Verbier locals, went to New York to further their art careers. Kiki had previously worked with Christo and Jean-Claude on their Umbrellas project in California, and when the two returned to Verbier, they brought back to Switzerland a sense that monumental artworks could be redefined to sit within the sublime landscape of the Alps, versus trying to compete with it. 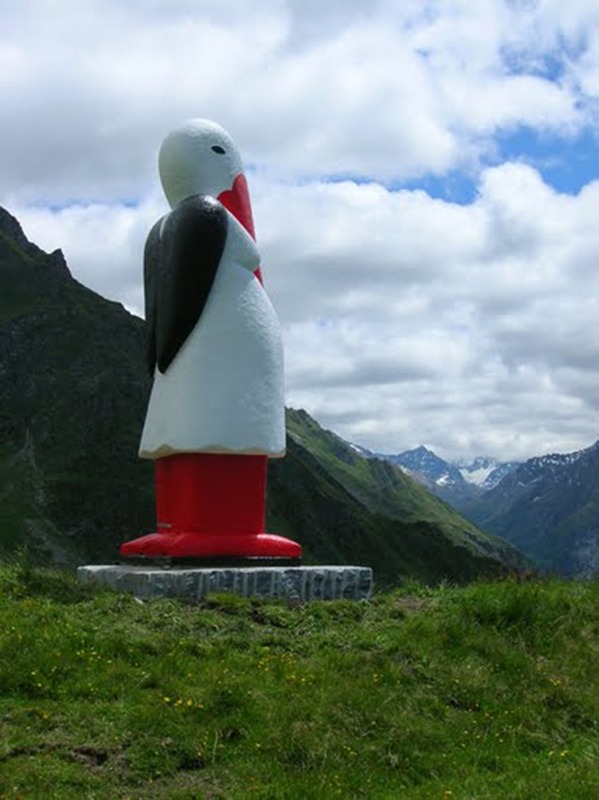 The original idea for siting works at Verbier was to use the structural pads of dismantled ski lifts, but eventually Kiki was persuaded to place the works along one of the high altitude access roads at just above 2300 meters—putting the sculpture park at almost the same elevation as Furka Pass, where we had started our fieldwork three days earlier. We claimed a couple of gondolas on the tramway and up the mountain we went. The day had stayed relatively clear, despite a weather report that threatened rain, and we gazed across the Valais to the Gran Combin and the Mt. Blanc Massif, the summit of the latter already wreathed in clouds. This was by far the sculpture park with the best view in the world, a daunting prospect for any artist. Donna Dodson, Baby Bringer, 2011. Photo by Donna Dodson. We had about an hour to run through the outdoor exhibition, and the first work we encountered, (and the first piece commissioned for the park) was a huge styrofoam-and-cement sculpture in red, white, and black by American Donna Dodson. Titled Baby Bringer, it was a 4-meter tall sculpture of an endangered Swiss white stork. Dodson’s work is meant to celebrate, in her own words “the mystical relationship between human beings and the animal kingdom. Baby Bringer, according to the artist’s website, was made to evoke fertility and motherhood while subverting “the popular myth that storks bring babies in a diaper clasped in their beaks.” We admired the impulse, but in the mountainous context the work seemed almost cartoonish. Andrea Hasler, Perishable Goods, 2014. Photo courtesy 3-D Foundation. At the opposite end of the aesthetic spectrum was Perishable Goods by Andrea Hasler made earlier in 2014. Hasler, a Zurich artist now based in London, is known for making sculptures of luxury goods out of wax and resin that look remarkably like bled out internal organs and meat. A pallet bearing approximately a cubic meter of compressed “flesh” had been installed on a path several feet above the road. 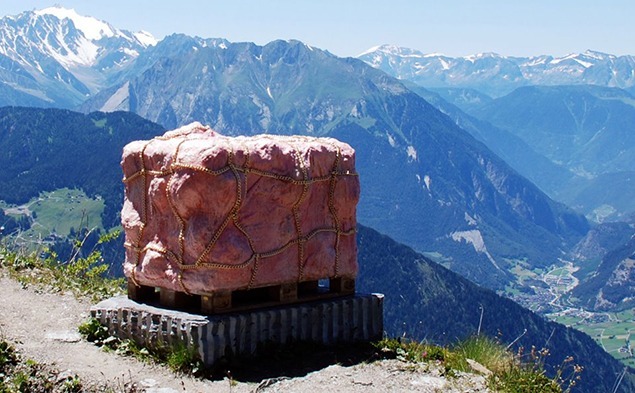 The cube of Pepto Bismal pink was wrapped in gold chains as if the flesh of tourists were prepared for sale, while the pallet alluded to emergency aid packages dropped by relief agencies in disaster areas. It’s meant to be a trenchant commentary on the contrast between the lifestyles of the ultra rich “1 %” tourists and the rest of humanity, but it doesn’t have the same visceral effect as when she used the same technique previously to portray a camp tent erected at a nuclear testing protest. Bureau A: Antoine, 2014. Photo courtesy 3-D Foundation. But two works do work for most of us, one a concrete shelter by Bureau A, a Swiss architecture partnership that built an inhabitable emergency shelter fashioned to look from a distance like a boulder about to roll downhill. The work fit into the landscape—indeed, almost sought anonymity in it—and referred to military installations as well as ski area survival huts. 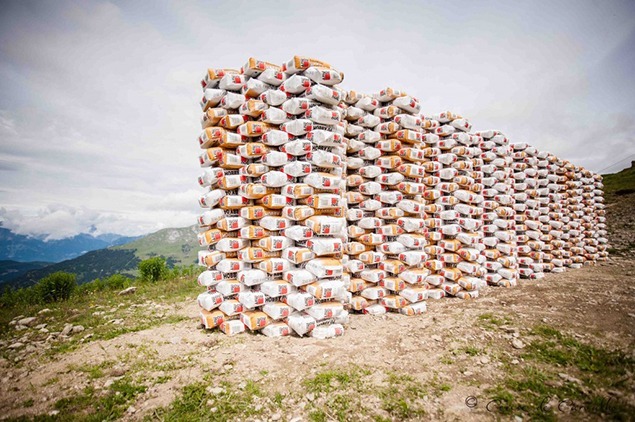 The other work was by another Swiss, Tarik Hayward, whose large stack of cement bags is meant to suffer degradation by wind and water, eventually ossifying into a pile of set concrete retaining the form of its bags, the paper eroding away. The work alluded to the use of concrete in the region, the extraction of local materials, and contemporary ruins. Tarik Hayward, Unity Temple, 2014. Photo courtesy 3-D Foundation. The sculptures are created in a Verbier workshop during residencies by the artists, who are given time to orient themselves to the region, the town and its dynamics, and the specific sites available in the ski area. The overall strategy deployed is similar to that of Jean-Maurice Verone: start with sculptures that people can relate to, then slowly curate in more daring works. As we walked along the dirt road, Kiki said that the plan had worked, townspeople and visitors coming over time to enjoy the sculptures. Both government funding and private sponsorship support the effort, and the ski resort is itself keen about the use of art to increase its leverage as a tourist destination. 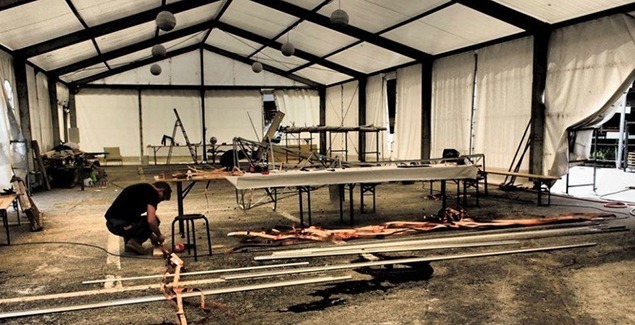 The 3-D Foundation’s artist residency. Photo courtesy 3-D Foundation. It seemed as if both Kiki and Jean-Maurice Verone have brought back to their birthplace a desire to increase the cultural sophistication of the surroundings, to match the allure of the visual culture of the large cities where they have been working. Benoît had noted earlier, in fact, that the mountains are increasingly serving as leisure parks for people who live in the cities, a process of gentrification. The conundrum is that people have traditionally come to the mountains to experience an authentic rural experience that is free from the social tensions, strictures, crime, and pollution of cities. The art they expect to see is folk art true to the history of the place. But the people who live in the mountains don’t live in a history museum and their own tastes and desires evolve over time. So, when people who have grown up in the Alps leave and then return bearing a different set of aesthetics, and when they propose using art to increase tourism in a post-industrial economy—well, you can see the inherent contradictions. We had walked at a fast pace but nonetheless barely made it back to the lift to take the last car of the day back to Verbier, thankful that we were not going to spend the evening stumbling down the service roads of the ski resort in the dark. Once debouched from the cable car, we took time to sit in a small plaza at the base of the lifts. I watched tall and improbably slender young blondes with high cheekbones walking small dogs, and the somewhat well-fed middle-aged men with Russian accents accompanying them into boutiques, and wondered what they made of the art as they took day hikes above the town.